The continuing recovery of the UK’s manufacturing sector is set to return UK business output to growth, according to the latest Business Trends Report by accountants and business advisers BDO LLP. In the latest report, BDO’s Output Index – which indicates how businesses expect their order books to develop over the next three months – has risen to 95.1 from 94.9 in June, returning above the point of contraction, 95.0. The small increase indicates that output is rising once again, albeit at a very slow speed. The report reveals that the return to output growth has been driven solely by the improving performance of the manufacturing sector as the services sector output continues to contract. BDO’s Manufacturing Output Index increased to 98.6 in July from 97.6 in June, and is rising closer to the long-term growth trend at 100. 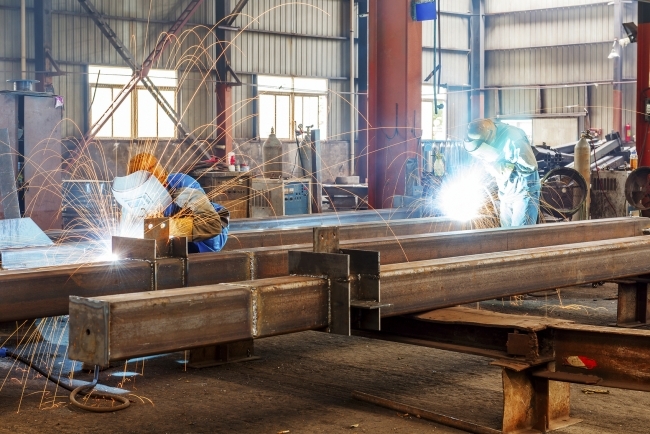 The recovery of the UK’s manufacturing sector is encouraging for the health of the UK economy. However, as the sector only accounts for a about a tenth of all UK economic output, its resurgence has a marginal effect on the overall growth of the economy, reflected by the 0.2 rise in the overall Output Index. BDO’s Services Output Index remained at 94.4 for the second month running, 0.6 below the point of contraction of 95.0. According to ONS figures1, the services sector grew 0.5% in Q2 of 2017, but the Services Output Index indicates that order books in the sector are set to shrink in the coming three months, which would leave the growth of the UK economy stuttering towards the end of 2017. BDO’s Optimism Index suggests a more positive outlook for early 2018, particularly for manufacturers. 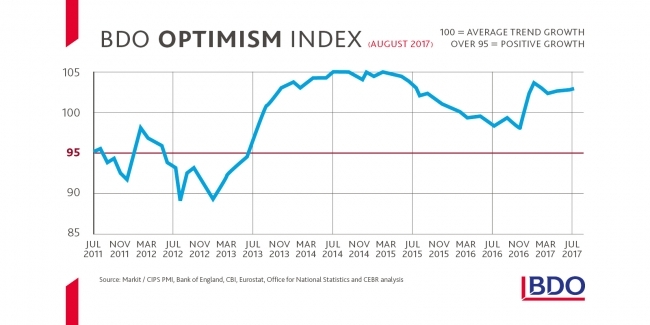 The Optimism Index – which indicates how firms expect their order books to develop in the coming six months – increased to 103.0 in July, from 102.9 in June. Echoing this month’s Output Index, the manufacturing sector is responsible for the increase. The results show that UK Manufacturers are expecting a flurry of business activity, with its sector Optimism Index climbing to 121.4, well above the long-term trend. However, the services sector outlook for 2018 is less optimistic. Its sector Optimism Index has fallen 0.1 to 99.5 in July, below the long term trend but still in growth territory. The overall outlook from UK services has been on a downward trend since 2015, but this has been more distinct since the EU referendum. Commenting on the findings, Tom Lawton, Partner and Head of Manufacturing, BDO LLP, said: “Amidst slowing growth in the economy as a whole, UK manufacturing is a definite bright spot at the moment. “However, our sense is that the recovery is weakening month on month. 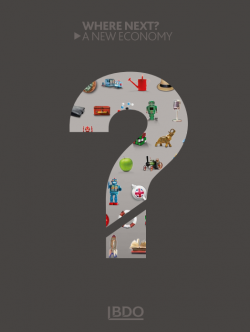 Given the continuing ability of the UK to create jobs at a surprisingly fast rate and the continuing relatively high levels of inflation, we can understand the calls for a hike in interest rates.